Background/Purpose: Guidelines recommend low-dose, short-duration glucocorticoid (GC) treatment for RA,1,2 but long-term use, especially at prednisone-equivalent doses >5 mg/d, should be avoided.2 Many patients (pts) with early and established RA receive long-term GCs, often ≥5 mg/d.3 SEMIRA (Steroid EliMination In RA) compared GC tapering vs continuation for maintaining disease control in RA pts with chronic GC exposure who were receiving tocilizumab (TCZ). Methods: Before randomization pts had to receive TCZ +/– conventional synthetic (cs)DMARDs and GC (prednisone-equivalent dose 5-15 mg/d) for ≥24 weeks (wks). At randomization pts had to be in at least stable low disease activity (LDA: DAS28-ESR ≤3.2) and stable concomitant therapy (prednisone 5 mg/d [GC5mg]) and TCZ +/– csDMARDs) for ≥4 wks. Pts were randomized either to continue blinded GC5mg for 24 wks or to undergo blinded taper (GCtaper, starting at 4 mg/d with 1-mg reduction every 4 wks to 0 mg/d at wks 16-24) while receiving stable TCZ and csDMARD doses. Pts who experienced RA flare received open-label prednisone 5 mg/d rescue therapy for 2 wks and continued blinded treatment. The primary outcome was mean change in DAS28-ESR at wk 24. The key secondary outcome was “treatment success”— DAS28-ESR ≤3.2 at wk 24 and no RA flare during 24 wks and no adrenal insufficiency requiring replacement therapy. Results: 259 pts were randomized to GCtaper (n = 131) or GC5mg (n = 128); 114 and 112, respectively, completed 24 wks. Mean baseline DAS28-ESR was 1.9. Mean RA duration was 9.2 years. For the primary end point, the between-arm difference was 0.6 DAS28-ESR units (95% confidence interval: 0.346, 0.879) favoring GC5mg. Results were consistent across key subgroups (Table). The majority of pts in both arms achieved treatment success (65% GCtaper vs 77% GC5mg, with a significant difference; Table). No pts discontinued from the GCtaper arm due to insufficient flare control. Serious adverse events were reported for 5% of GC5mg vs 3% of GCtaper pts with no deaths. There were no cases of symptomatic adrenal insufficiency. Conclusion: Continued GC 5 mg/d provided better DAS28-ESR control than GC taper in RA pts in LDA or remission. 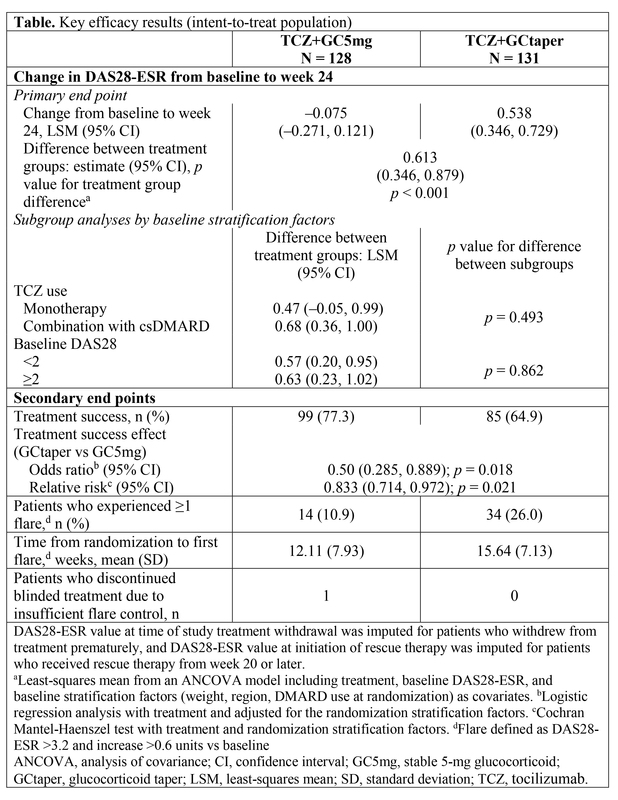 The 0.6 DAS28-ESR unit between-arm difference should be interpreted in the context of approximately two-thirds of tapered pts experiencing treatment success and no tapered pts discontinuing due to lack of flare control. The taper schedule was safe regarding adrenal insufficiency. Together these results suggest that all pts achieving LDA or remission with TCZ who are receiving long-term low-dose GC should be considered for GC tapering, ideally targeting discontinuation. References: 1. Singh JA et al. Arthritis Rheum. 2016;68:1. 2. Smolen JS et al. Ann Rheum Dis. 2017;76:960. 3. Buttgereit F, Bijlsma JW. Ann Rheum Dis. 2017;76:1785. Funding: F. Hoffmann-La Roche Ltd (Roche). Medical writing: Sara Duggan, PhD, funded by Roche. Disclosure: G. R. Burmester, Roche, Sanofi, Genzyme, 5,Roche, Sanofi, Genzyme, 8; F. Buttgereit, None; C. Bernasconi, Roche, 5; J. M. Alvaro-Gracia, Roche, AbbVie, Pfizer, Lilly, UCB, MSD, BMS, Novartis, Sanofi, 5,Roche, AbbVie, Pfizer, Lilly, UCB, MSD, BMS, Novartis, Sanofi, 8; N. Castro, F. Hoffmann-La Roche Ltd., 1,F. Hoffmann-La Roche Ltd., 3; M. Dougados, Roche, 9; C. Gabay, Roche, Pfizer, ABZ Bio Ltd., 2,Roche, Pfizer, Lilly, AbbVie, Sanofi, Regeneron, BMS, Novartis, UCB, ABZ Bio Ltd., Debiopharm, 5; J. van Laar, Roche Lilly, Arthrogen, Janssen, 5,AstraZeneca, Genentech, MSD, Pfizer, Lilly, 2; J. M. Nebesky, F. Hoffmann-La Roche, 1,F. Hoffmann-La Roche, 3; A. Pethö-Schramm, F. Hoffmann-La Roche, 1,F. Hoffmann-La Roche, 3; C. Salvarani, None; M. Y. Donath, Roche, 5; M. R. John, Roche, 1,Roche, 3. Burmester GR, Buttgereit F, Bernasconi C, Alvaro-Gracia JM, Castro N, Dougados M, Gabay C, van Laar J, Nebesky JM, Pethö-Schramm A, Salvarani C, Donath MY, John MR. A Randomized Controlled 24-Week Trial Evaluating the Safety and Efficacy of Blinded Tapering Versus Continuation of Long-Term Prednisone (5 mg/day) in Patients with Rheumatoid Arthritis Who Achieved Low Disease Activity or Remission on Tocilizumab [abstract]. Arthritis Rheumatol. 2018; 70 (suppl 10). 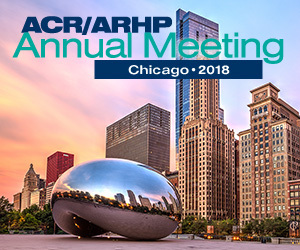 https://acrabstracts.org/abstract/a-randomized-controlled-24-week-trial-evaluating-the-safety-and-efficacy-of-blinded-tapering-versus-continuation-of-long-term-prednisone-5-mg-day-in-patients-with-rheumatoid-arthritis-who-achieved-l/. Accessed April 21, 2019.